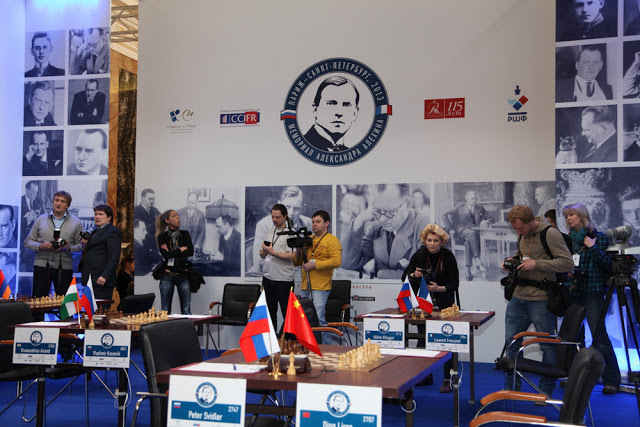 The games of the last round of the Alekhine Memorial were played on May 1st in St. Petersburg. 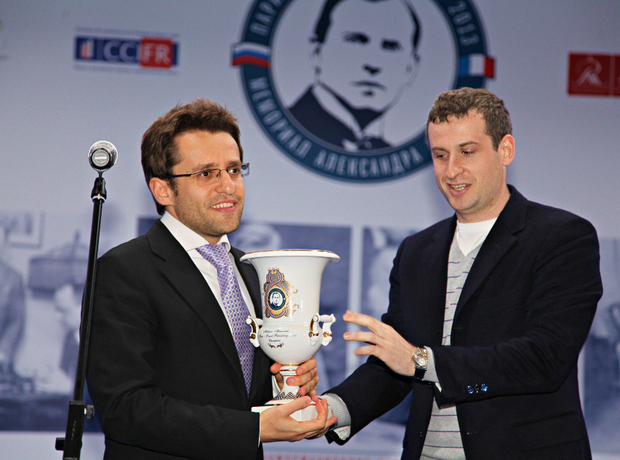 Levon Aronian and Boris Gelfand shared the first place with 5.5 points out of 9. The Armenian Grandmaster had a better tie-break score and was awarded the first prize. The Israeli Grandmaster took the second place. The reigning World Champion Vishy Anand finished third with 5 points. In the last round, Boris Gelfand had White against Vishy Anand. Last year these players competed for the chess crown in a World Chess Championship match in Moscow. Their game was quiet and ended in a draw on the 40th move. Levon Aronian played a very aggressive opening against the recent leader Maxime Vachier-Lagrave. The French Grandmaster ended up in severe time trouble and soon committed the decisive error. Thanks to this victory, Levon Aronian, who considers Alexander Alekhine his favorite player, won the Alekhine Memorial. At the closing ceremony Aronian thanked the sponsors of the event, its organisers and spectators, who showed genuine interest to the tournament and inspired its participants to demonstrate their creative talent. The longest game of the round was Adams-Kramnik. The Russian Grandmaster managed to score his second victory, and finished at 50%. The main prizes and special prizes were awarded during the closing ceremony. The prize for a game in Alekhine's style was given to Laurent Fressinet who defeated Vladimir Kramnik in Paris. The best combination prize went to Ding Liren for his victory against the eventual tournament winner. Boris Gelfand received the best technique prize and Nikita Vitiugov got the last special prize for the best play during the St. Petersburg half of the tournament. Resuts of Round 9: Aronian – Vachier-Lagrave 1-0, Adams – Kramnik 0-1, Gelfand – Anand, Vitiugov – Ding Liren, Svidler – Fressinet draws. Final standings: 1-2. Aronian and Gelfand – both 5.5; 3. Anand – 5; 4-8. Adams, Vitiugov, Fressinet, Kramnik, and Vachier-Lagrave – all 4.5; 9. Ding Liren – 3.5; 10. Svidler – 3. The penultimate, 8th round of the Alekhine Memorial was played in St. Petersburg on April 30th. The young St. Petersburg Grandmaster Nikita Vitiugov celebrated his first victory. With Black pieces he outplayed the French Grandmaster Maxime Vachier-Lagrave, who was undefeated and shared the first place before the start of the round. St. Petersburg spectators applauded the local player after the game. Another St. Petersburg Grandmaster, the World Cup winner Peter Svidler made a relatively easy draw as Black against the World Chess Champion Vishy Anand. Soon after that another draw occurred in Fressinet-Aronian. Ding Liren from China and Michael Adams from England played a very complicated and hard-fought game, which ended peacefully. 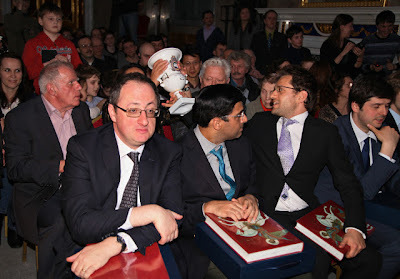 The longest game of the round was played between Vladimir Kramnik and Boris Gelfand. It was also very important for the tournament situation. Kramnik demonstrated a strong novelty and obtained a big advantage. Gelfand defended very tenaciously, as drawing the game would make him a sole leader of the tournament. After seven hours of play, following the series of mutual errors, the game was finally drawn. The last round of the Alekhine Memorial is played on May, 1st. Results of the round 8: Vachier-Lagrave – Vitiugov 0-1, Kramnik – Gelfand, Fressinet – Aronian, Dong Liren – Adams, Anand – Svidler – all draws. The standings after eight rounds: 1. Gelfand – 5; 2-5. Adams, Anand, Aronian, Vachier-Lagrave – all 4.5; 6-7. Vitiugov, and Fressinet – both 4; 8. Kramnik – 3.5; 9. Ding Liren – 3; 10. Svidler – 2.5. The 9th round games: Gelfand – Anand, Aronian – Vachier-Lagrave, Adams – Kramnik, Vitiugov – Ding Liren, Svidler – Fressinet. The 7th round of the Alekhine Memorial was played on April 29th. Before the start of the round it was announced that the charity funds Ladoga and Neva created four special prizes: the best game in Alekhine's style, the best combination, the best technique, and the best result in the St. Petersburg part. These prizes will be awarded at the closing ceremony on May 1st. There were two decisive games in the 7th round. The World Champion Vishy Anand scored his second victory in the tournament, defeating the French Grandmaster Laurent Fressinet with White. This sharp game was not ideally played by both sides, but Anand made a better use of the opponent's mistakes, and is now just half a point behind the leaders. His former opponent in the World Championship Match Boris Gelfand defeated young Chinese Grandmaster Ding Liren with White. This victory allowed Gelfand to tie for the first place with two rounds to go. Round 7 results: Anand – Fressinet 1-0, Gelfand – Ding Liren 1-0, Adams – Vachier-Lagrave, Vitiugov – Aronian, and Svidler – Kramnik – draws. The standings after seven rounds: 1-2. Gelfand and Vachier-Lagrave – both 4.5; 3-5. Adams, Anand, and Aronian – all 4; 6. Fressinet – 3.5; 7-8. Kramnik and Vitiugov – both 3; 9. Ding Liren – 2.5; 10. Svidler – 2. The 8th round pairings: Kramnik – Gelfand, Vachier-Lagrave – Vitiugov, Fressinet – Aronian, Ding Liren – Adams, Anand – Svidler. 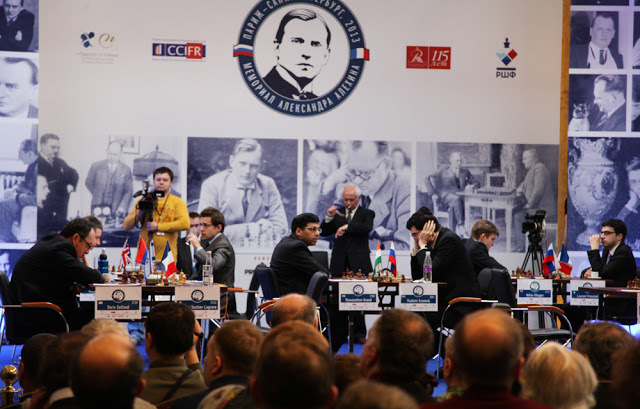 The second half of the Alekhine Memorial began in St. Petersburg on Sunday with the sixth round. The official opening of the Russian half of the competition took place on April 26th in the Mikhailovsky Castle of the Russian Museum. Participants and guests of the tournament were welcomed by Vladimir Gusev, director of the Russian museum, FIDE President Kirsan Ilyumzhinov, Russian Chess Federation Chairman Ilya Levitov, and the sponsors of the event Gennady Timchenko and Andrey Filatov. April 27th was the only day off at the tournament. The participants of the Alekhine Memorial, representing seven countries, enjoyed an excursion in the Russian Museum. Junior chess events and many excursions were organized in the Mikhailovsky Castle. On the next day the St. George Hall of the Mikhailovsky Castle hosted games of the Round 6. Like in Paris, the hall was tightly packed with chess enthusiasts. The games were quite entertaining but all ended in draws, so the tournament situation remained the same – the French Grandmaster Maxime Vachier-Lagrave is in the lead. He had White against Boris Gelfand, but their game was quite equal all the way. Michael Adams, who had Black against Levon Aronian, missed a real chance to catch up with the leader. The Armenian Grandmaster fought very hard for a win, even sacrificed a piece, but the sacrifice turned unsound, and Aronian was on the verge of defeat. However, his English opponent returned the favour, missing a win in mutual time trouble, and allowed Aronian to save the game. Both players are just half a point behind the leader and have decent chances of winning the tournament. With three more rounds to go, a good half of the participants have chances to succeed. The winner of the Alekhine Memorial 2013 will be determined on May 1st. Round 6 results: Vachier-Lagrave – Gelfand, Aronian – Adams, Fressinet – Vitiugov, Kramnik – Anand, Ding Liren – Svidler – all draws. The standings after six rounds: 1. Vachier-Lagrave – 4; 2-5. Adams, Aronian, Fressinet, and Gelfand – all 3.5; 6. Anand – 3; 7-9. Kramnik, Vitiugov, and Ding Liren – all 2.5; 10. Svidler – 1.5. The 7th round pairing: Adams – Vachier-Lagrave, Anand – Fressinet, Gelfand – Ding Liren, Vitiugov – Aronian, Svidler – Kramnik.